Securing a down payment is often cited as the biggest challenge for buying a home – both for First Time Home Buyers and Move-up Buyers. To overcome these challenges, you can consider borrowing from retirement funds – 401k and IRA. How Much Can I Borrow From My 401k? You can borrow 50% of your vested balance or $50,000 whichever is lower. The repayment term is usually between 5 and 15 years. The payment which includes interest is deducted directly from the paycheck and deposited back into your 401k account. 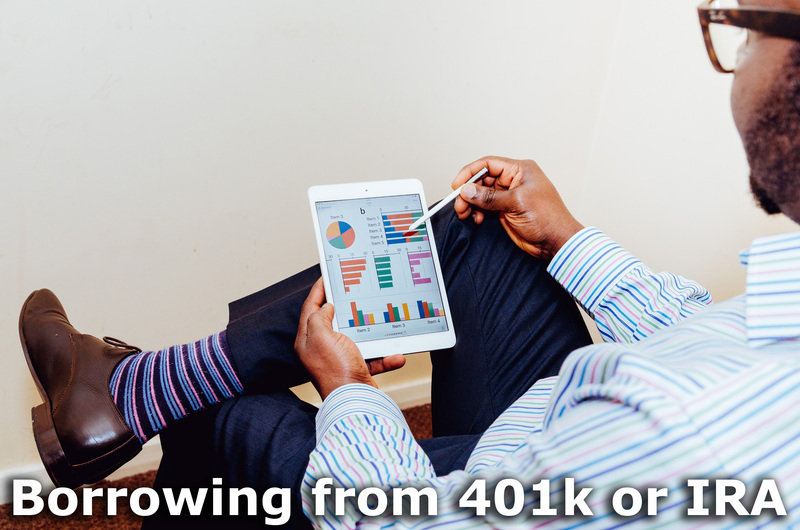 Understand the terms of your 401k carefully as some plans may require you to pay off the remaining balance in a lump sum if you leave that organization. Since you are borrowing from yourself (it’s your savings), the payment is not considered a debt and not included in the debt-to-income ratio calculations for mortgage qualification. What Are The Tax Implications of Borrowing from 401k? Note that borrowing from 401k and withdrawing have different tax implications. You can borrow up to 50% of the vested balance (or $50,000 whichever is lower) with no tax implications. On the other hand, any withdrawal will have a 10% penalty on top of the income tax that you will need to pay. After adjusting for taxes and penalty, you might end up with only 60% of your withdrawal amount. How Much Can I Borrow From IRA and What Are The Tax Implications? From Roth IRA you can withdraw contributions any time with no tax implications. After you have held the account for 5 years, you can withdraw an additional $10,000 from the earnings with no penalty or taxes. From Traditional, SEP or SIMPLE IRA, you can withdraw $10,000 with no penalty. And if you are married, your spouse can withdraw another $10,000. That could mean a total of $20,000 contribution towards down payment with no penalty or taxes. For all the IRAs the withdrawn earnings have to be used within 120 days to avoid the 10% penalty. Disclaimer – I am not a CPA, nor do I play one on the internet. Make sure to consult your accountant about tax implications specific to your situation.